ATLANTIC CITY, N.J.—For years, Bernard Hopkins has entered the ring for each of his fights wearing a black balaclava, only his eyes visible, arms crossed overhead in an "X" to signify his nickname, "The Executioner." Outside the ring, he's a chatty bald man with a flattened nose and kindly eyes, now given, at his advanced age of 47, to popping up on TV as a boxing pundit in the sweater-and-pastel-tie wardrobe of a progressive ad agency creative director. Which is not to say that Bernard Hopkins is not a badass; it's simply to say that he's first a showman. Saturday night, the show ended. Atlantic City's Boardwalk Hall is a long oval of seats topped by a vaulted roof, overseen by a massive nautical mural on the back wall, which has inspired who knows how many thousands of "ship has sailed" metaphors from hack sportswriters covering fights there over the years. Hopkins had come to fight his rematch with Chad Dawson, after their last fight—one of the most regrettable pay-per-view buys in recent memory—ended in a worthless no contest after Hopkins was dumped through the ropes onto his shoulder in the second round and couldn't continue. Some accused Hopkins of faking that injury, but let's give him the benefit of the doubt. At his age, things break easily. And that, of course, is the backdrop of every Hopkins fight: How long before it all falls apart? In boxing, the athletes don't quietly retire in the offseason. They fall apart, violently, at the hands of a younger and stronger foe, before a national audience. It's bizarre enough that Hopkins has been able to keep fighting this long, but stranger still that he's been able to fight well enough to beat world champs—just a year ago, he made the fearsome Canadian puncher Jean Pascal look cowed, confused, and beleaguered in a win that had Hopkins ostentatiously doing pushups between rounds, then popping up to snap the younger man in the face with lead rights until he more or less cried uncle. It was the greatest performance for a boxer of Hopkins's age since ... ever. Most boxers his age are long retired and looking for a new hustle to pay their neurologists' bills. The fight's undercard was, like war, a dreary procession of boredom punctuated only by a couple of moments of sheer terror. The first was Atlantic City's own Lavarn Harvell's battering of Tony Pietrantonio, who insisted on trying to roll under incoming punches with his hands down even though he was slower than his opponent, which is an automatic recipe for doom. By the end of the second round he staggered back to his corner, hands on his head, like a man who had suffered a great tragedy. Neither his cornermen nor the referee had the benevolence to stop it, so Pietrantonio grimly answered the bell in the third and got knocked out so bad with a straight right hand that the ring doctor immediately waved in the stretcher without so much as a slap on the sleeping fighter's cheek. Even Harvell, who had broken into a celebratory dance after his knockout, stopped dancing and hovered over his fallen opponent with a look of concern. Sometimes giving up is the wisest course of action. If your advisers can't give up for you when you're teetering on the edge of destruction, find some new advisers. The other explosion of savagery came when Seth Mitchell, a young, tank-like heavyweight and former football player (who actually looks to be in shape, with visible abs, almost unheard of in the uppermost weight class), took on "The Gentleman" Chazz Witherspoon, who introduced young Seth to an advanced boxing technique called "the ol' one-two": one jab to bring Mitchell's gloves up to the front of his face, and then, after a teeny step to the right, a hard downward right hand behind Mitchell's ear. Heavyweights have heads too big for any gloves to cover. Witherspoon nearly brought Mitchell down with these shots in the first round, which would have been goddamn amazing, but Mitchell hung on, and then started throwing left hooks which could, by my estimation, knock out a medium-sized ruminant—an antelope for sure, and perhaps an adolescent bison. Witherspoon caught one of these with his head in the third round, clung to the ropes, and the ref, perhaps chastened by Pietrantonio's brutal end, stopped the fight before the final smash could be applied. Mitchell cried. Witherspoon survived. It was civilized. The national anthem was sung by Bunny Sigler, an achingly sappy Philly soul-lite guy with no neck, a red tie, and a bright white suit, like Valentine's Day at T.D. Jakes's church. Chad Dawson entered the ring to James Brown's "The Big Payback," a very astute song choice that did not save him from being showered with boos by the Philly Hopkins partisans. Dawson's own cheering section consisted of 10 loud guys from Connecticut, tightly clustered halfway up in the stands on one side of the ring. This, for the light heavyweight champion of the world. Chad Dawson's charisma deficit is only his second-worst problem. The first is that, although he possesses every last physical attribute that a fighter could hope for—a tall, slim, well-muscled build, long arms, natural athleticism, and serious power—he fights with all of the urgency of a man who is not in a fight. Some boxers are deliberate because they are crafty, careful, and trying to make up for being physically overmatched. Chad Dawson is deliberate for no apparent reason. With his gifts, he could be racking up spectacular knockouts everywhere, using his reach and a jab to keep fighters back, then unleashing combos too copious to be withstood. Instead he stands around looking a lot. He's the best light heavyweight in the world. But he's not exciting, for reasons known only to Chad Dawson. Hopkins does not have this problem. Hopkins is a far, far lighter puncher than Dawson—his jabs looked as if they wouldn't raise a bruise on the cheek of a newborn—but he always puts on a show. He struts. He gesticulates. When pushed, he tends to fly off into the ropes and then raise his arms to the ref in protestation like a wronged professional wrestler. Several times Hopkins ducked a Dawson hook, then turned on his heel, showed his back, and gave a little shoulder shake, walking away while sticking his tongue out. Hopkins is actually a dirty fighter—he grabbed behind the head, he hit Dawson in the nuts in several clenches, he even split open his opponent's eyebrow with a headbutt which was probably intentional—but we forgive him for all of it, because he puts on that show. And because he's 47. Fighting dirty is just another survival tactic. Fair game. Dawson wore gray gloves with neon-green highlights. Hopkins wore black gloves with red and green highlights. When their punches met in the middle they looked like two Amazonian tree frogs attacking one another in flying leaps. Hopkins beats men not with power, but with craft. He uses his feet to stay outside of his opponent's punching range, jumping in to land one shot and then backing out again; if the distance is closed to his dissatisfaction, he grabs and smothers in order to not be hit. He played to character on Saturday night, with one notable exception: His punching power, which was never spectacular, has now completely deserted him. His punches now are more notional than purposeful. 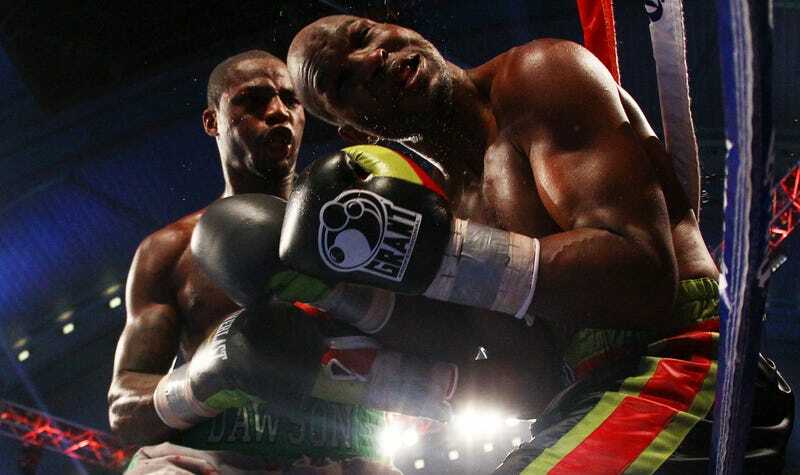 When he leaped in toward Dawson from the outside, he hit him with soft pitty-pat jab-rights which would not have knocked down Chad Dawson or dissuaded him in any manner whatsoever, even if Hopkins had landed a hundred of them. They were mere representations of punches. Hopkins's main task was survival. He still played it well. He still wore his balaclava and made his "X" sign and stuck out his tongue and complained to the ref and fake-smiled in the middle of rounds and generally comported himself as if this championship fight could not have troubled him less. But in reality, he has reached an age at which he must expend all of his effort just to save himself from physical destruction. Chad Dawson hits hard. He doesn't punch as often as he should, but when he does, it is deadly. Chad Dawson stepping in and firing a right hand at 100 percent power is a fearsome thing to behold. Chad Dawson's left hook, even when blocked, echoes off the rafters like a bag of cement being dropped from a high platform. Each time Bernard Hopkins was hit, he clung onto Chad Dawson like a remora, knowing damn well that to let go could mean an ignominious and violent fate at the hands of a man much younger and stronger than himself. And that's not Bernard Hopkins's style. He is a grand figure. He does not want to go out on his back. He cannot beat world-class competition any more. But he can damn well hang on and survive. Better to be dirty than to be humbled. He lost nearly every round. Two judges scored it 117-111 for Dawson. But when the final bell rang, Bernard Hopkins raised the "X" in the air as if he'd won again. He's earned that. And if he's as smart as I think he is, he'll never fight anyone that good again. Hamilton Nolan writes for Gawker. Photo via Getty.